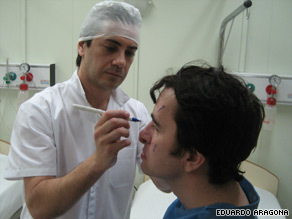 BUENOS AIRES, Argentina (CNN) -- James Brandon is concerned about getting old and looking older. So the 44-year-old events planner from Canada decided on plastic surgery to help bring his boyish looks back. Surgeon Williams Bukret and patient James Brandon.